There are a wide range of different wires that are used in the lathing process of stucco these days, so I wanted to write this post to discuss some of the different kinds available and what they are used for. Certain types of wire are better suited for different things and knowing which type of lath to go with will make the job a whole lot easier to do. ​This particular wire is commonly used in the three coat stucco system and is a fairly strong kind of wire. It is furred, which means that it sticks off of the wall a little bit (about a quarter inch or so) so that the stucco mix can "key" in behind it. You really want the wire to be in the middle of your base coat, for the best possible installation. The two different pictures show the same gauge wire being used but the top picture is using wire that ​uses a square pattern and the lower one uses the more common honeycomb pattern. Both will work just fine and are acceptable for three coat stucco systems, just a personal preference type of thing. In order to achieve ​a furred product, the wire is crimped by a machine, so when it is rolled out along the wall, it will stand off of it a bit, roughly a 1/4". When installing the wire, you want to make sure these "crimps" are facing in so there is a gap between the wall and most of the wire. The wire can come in a non-furred version but is hardly used because you would have to use furred nails instead and most codes require the use of furred wire anyways. The wire is typically galvanized, in order to prevent corrosion of the wire over the years. 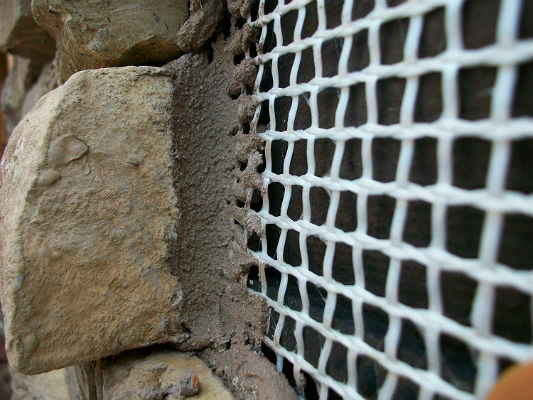 The holes in the wire are approximately 1 1/2 inches apart (depending on manufacturer), which doesn't really matter but is just another identifying factor for three coat stucco wire. Typical Sizes It Comes In: This type of wire comes in a roll and measures approximately 36" tall by 150' long, so roughly 450 sq. feet of wire. ​How Much Does It Cost: Price will vary by manufacturer but for estimation purposes, you can expect to pay somewhere between $45 - $60 a roll, which is approx. $0.10 - $0.13 per sq. foot. 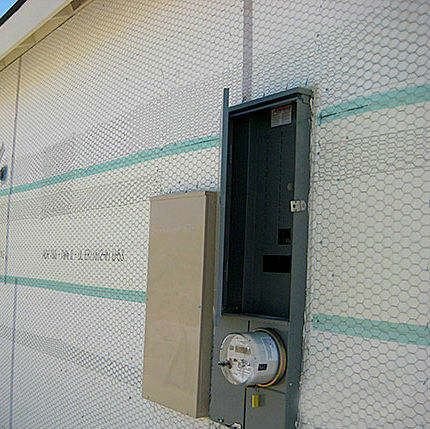 ​Where Do I Get It: ​You can find this at any stucco supplier, it is the most common type of wire around. I have also seen it on many of the Home Depot's I have been to, which makes it more convenient for most people. ​​This wire is the same as the 17 gauge, but a little thinner and flimsier. It is used in 1 coat stucco applications and has smaller openings than a 17 gauge wire and it not nearly as strong either. 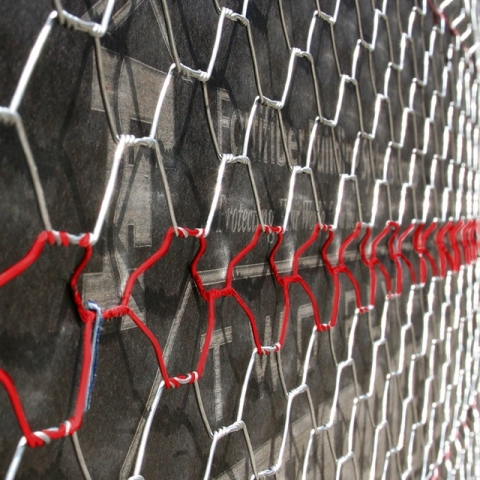 There is really only one style and it resembles the look and thickness of traditional chicken wire. This is really the only type of wire that is used for a one coat stucco installation and the wire is made specifically for it too, so keep that in mind. ​The one coat wire also has smaller spacing between the holes, which is about 1", compared to 1 1/2" spacing that the three coat wire has. Typical Sizes It Comes In: ​One coat wire comes in a roll, just like the three coat wire and measures ​the same, which is roughly 36" tall by 150' long, so ​an estimated 450 sq. feet of wire. ​How Much Does It Cost: Price will vary by manufacturer but for estimation purposes, you can expect to pay somewhere between $40 - $55 a roll, which is approx. $0.08 - $0.12 per sq. foot. ​Where Can I Get It: ​I have seen it at Home Depot but not every one I have been to. It seems to be available depending on the area I'm in. A stucco supply store will surely have it in stock most of the time. ​This type of wire lath is intended for ceilings and soffits. The design is made to hold the plaster in place, while minimizing the amount of fallouts. 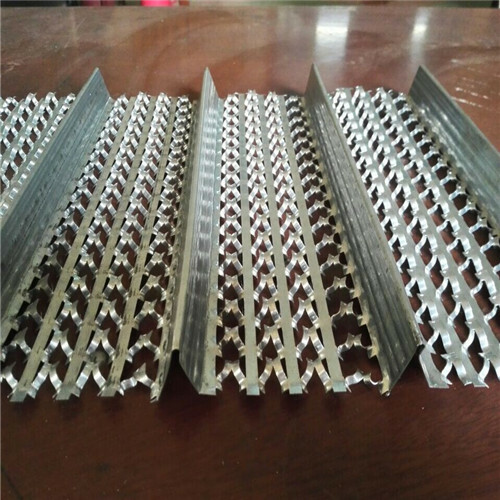 It resembles expanded metal lath, in a way but is much more rigid, due to the grooves that run down the length of the wire. The picture on the right shows the ridges in detail and this is how it is installed on a ceiling, with the points facing up. ​High rib lath is only used for ceilings and not for anything else. That is just from my experience, I am not saying it can't be used on a wall, it just isn't and I'm not even sure that building codes would allow it to be used on a wall. It is pretty hard to cut with a pair of tin snips, I usually end up using a small 4" grinder with a metal cutting wheel to make it go a bit quicker. Typical Sizes It Comes In: ​High rib lath comes in sheets that measure about 27" by 8' and are sheets as opposed to rolls. 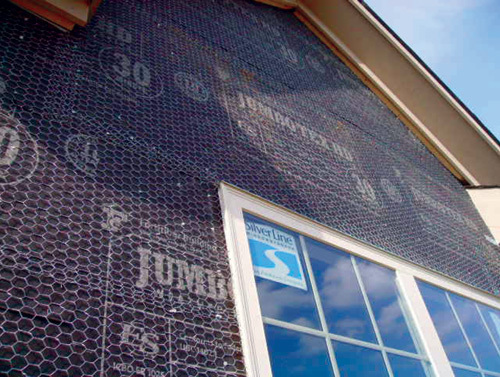 You will get approximately 16 square feet of coverage per sheet after overlapping the edges. ​How Much Does It Cost: Price will vary by manufacturer but for estimation purposes, you can expect to pay somewhere between $​4 - $10 a ​sheet, which is approx. $0.25 - $0.62 per sq. foot. What's It Used For: ​Soffits (ceilings) only. ​Where Do I Get It: ​​This is more of a specialty item and is usually found at a stucco supply yard. I have not seen it that often at any larger home improvement store, so I couldn't say whether or not they have it. ​This particular lath has a much smaller pattern in the wire itself. It allows the cement to bond to it very well and is usually used for patches, transitions and uneven surfaces. You can use it for your entire project, if your building dept. will allow it but it is more expensive than traditional wire and most people won't use it because of that reason. It also works great for stone veneer projects! ​Most of the sheets you will find will not be pre-furred, so they won't be up to code but you can get them furred (like the image to the right shows), which is usually a special order item. ​They come in three different weights and these are measure by the weight (not sure of the metric) of the screen per square yard. These are: 1.75, 2.5 and 3.5, (2.5) being one of the most common weights used in the industry. 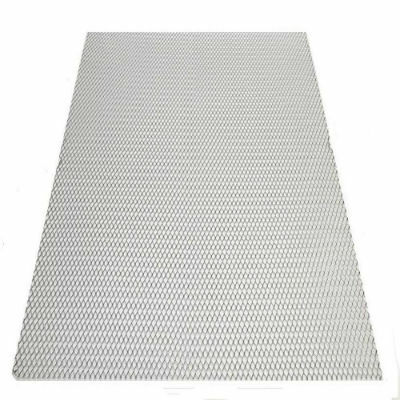 Typical Sizes It Comes In: ​​Expanded metal lath measures 27" wide by 8' in length, just like the high rib lath and come in sheets too. ​How Much Does It Cost: Price will vary by manufacturer but for estimation purposes, you can expect to pay somewhere between $​​3 - $​9 a ​sheet, which is approx. $0.19 - $0.56 per sq. foot. What's It Used For: ​​Patches, masonry, tile, stone veneer, etc. ​Where Do I Get It: ​​​This stuff can be found just about anywhere because it is so common and used by many different trades. I have noticed that a specialty store will have better prices and selections than a bigger chain store, just fyi. This type of wire has the paper attached to it already and is used for open stud applications mostly. A strand of wires runs the length of the paper and wire and is inter-weaved, connecting the two together. It has a bottom and top edge that are designed to fit on top of one another and overlap the paper and wire simultaneously. I typically will apply two layers of 60 minute building paper to the wall before I use this wire because these tend to have a tendency to leak a lot easier. No sheer on the wall means that there is hardly any backing for the paper and wire so installation is a bit harder and takes a little bit longer. ​Typical Sizes It Comes In: This wire can come in a roll that is approx. 36" wide by 100' long and can come in sheets that measure 28" by 104". ​Where Can I Find It: You can find this at a stucco supply store or sometimes a bigger box store. 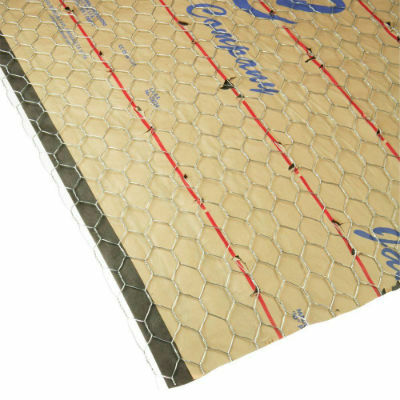 ​There is another alternative to metal and that is a fiberglass mesh (Spider Lath) that has furring strips along the back of it, that is code compliant and can be used instead. It is easier to cut and lightweight, making it a lot more user friendly. 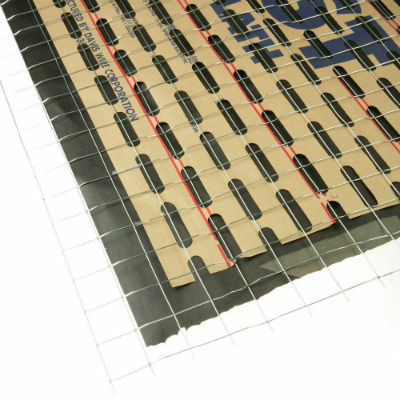 It is hard to get though and much more expensive than traditional metal lath. I was only able to find it on Amazon and nowhere else, even my local stucco supplier can't get any of this stuff! 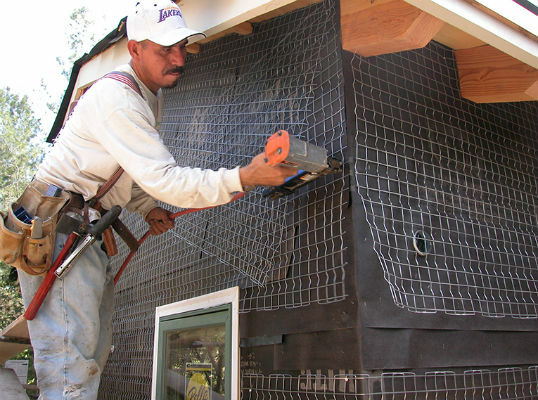 ​You can cut it with a regular pair of scissors or a utility knife and it is attached the same way as traditional metal lath is, either stapled or nailed (approved fasteners) on with galvanized or code specified materials. Below is a quick video that shows how the whole process works and what you can expect if you choose to go this route. The videos is all about the lath and scratch process for a stone veneer project but has valid info that applies to stucco as well. ​Wooden "slats" that are run horizontally are also a pretty common lath used, well it used to be, anyways. We don't typically use wooden lath as much because it is more work to install and more expensive, compared to modern materials and techniques. The picture shows the interior of a home that used wooden planks that the stucco "keys into" but wood lath can also be found on the outside of a home too. 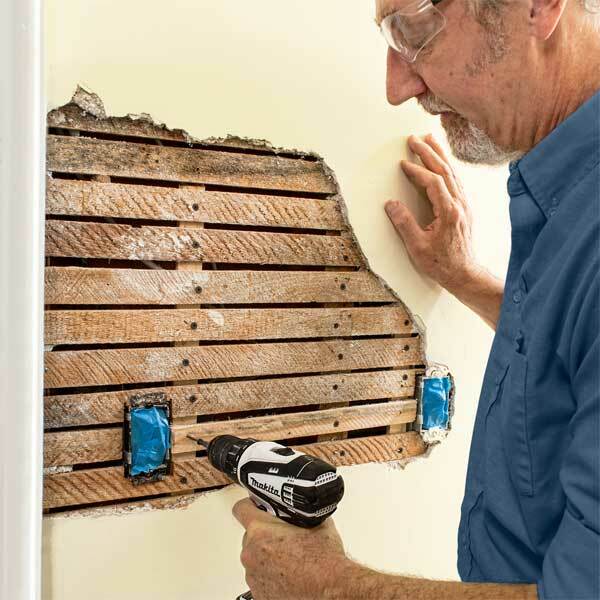 ​There is not really a whole lot more to say about the wooden lath, it is a pretty simple and self explanatory process. ​Nailing Patterns For Wire: Nailing off nearly all types of wire is the same, in essence, depending on your local building codes and engineering specs. Most wire requires you to nail it off at a "6 and 12" interval. This means that nails and/or staples around the edges of windows, corners of walls, bottom & top of walls will require a fastener every 6 inches and nailing every 12" on the studs themselves (vertically). ​What Is Furred Wire: ​​ Furring is basically a simple dimple that is made to hold off the wire ​off of the wall (evenly) about a quarter of an inch. These dimples are strategically placed on the wire to evenly hold the wire off of the wall. The picture on the right shows the wire (three coat stucco) furring in great detail. Notice the staple holding the wire in place, touching the wall and the rest of the wire has a gap. ​What Is K Lath: K lath is really a brand of wire made by the company Tree Island but has become a more "generic term" used for wire, particularly the square shaped wire found on most commercial stucco jobs (as shown in the first picture of ​three coat stucco wire). They make wire for nearly every type of stucco application though. ​What's The Best Way To Cut Metal Lath: Typically a good pair of tin snips will do the job, either smaller ones or the larger types available nearly everywhere. I use a small grinder with a metal cutting blade to cut high rib lath because it is cleaner and way quicker than using any type of metal cutting shears, due to the "ribs" in the wire. ​How Much Should I Overlap Wire: This depends on the wire type, more specifically how large the holes in the wire are. The larger the holes, the more overlap you will want to have. The wire that uses smaller, tighter holes requires less of an overlap. The "industry standard" is a 6" overlap for standard wire (three coat and one coat stucco wire) and the other wires will be somewhere around a 3" overlap but check with the manufacturer and local building codes first. These are MINIMUM requirements, so more is okay but don't try to save on wire by using less overlap, wire is cheap compared to problems that could arise later due to a less than recommended wire overlap distance. ​Did I forget anything? If so let me know in the comments below, any questions or comments you may have. Thanks!